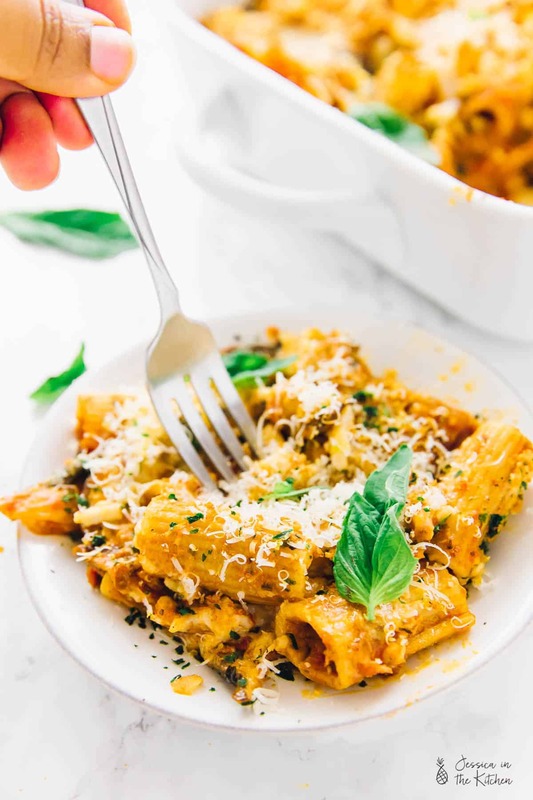 This Vegan Cheese Pasta Bake is the ultimate crowd pleaser and perfect for a weeknight meal or your holiday table! It’s easy and loaded with flavour! When I was younger, Italian food was my favourite. I’m talking all the pastas, and so when we went to Italy the first time, I was in heaven. Since then my favourite foods have switched up a bit, but I still love an easy, delicious and hot pasta dish. That’s one of the reasons I was so excited to make this Vegan Cheese Pasta Bake. 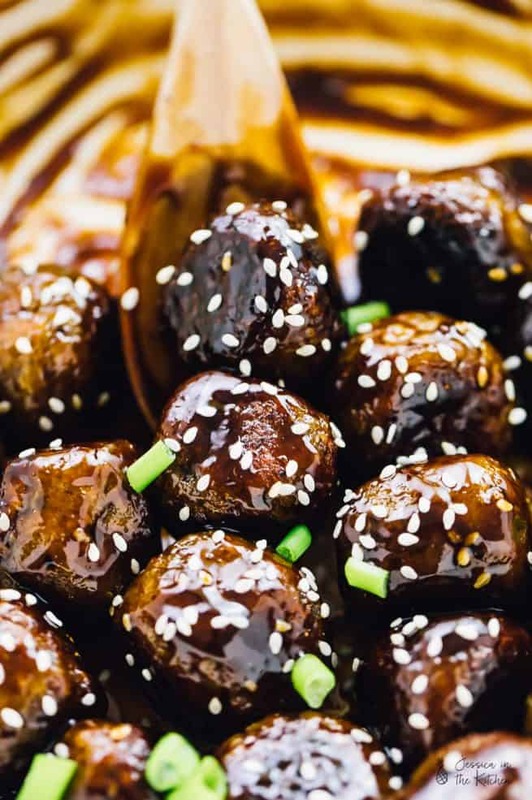 Comforting fall foods? Here we come. Oh my goodness. It has been a while since I’ve had a pasta bake. Let me write the ways I love thee. Cheesy? Check. Saucy? Check. Baked aka flavour heaven? Check check check. 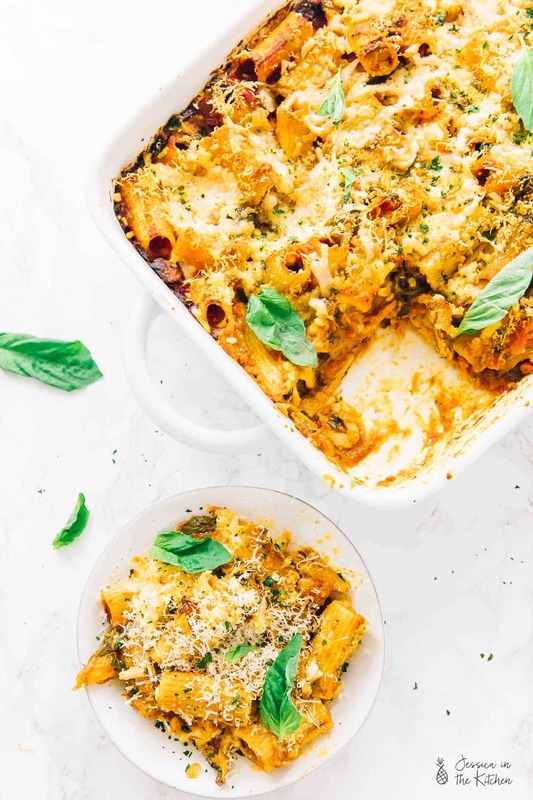 Instead of listing all the reasons why a pasta bake is an excellent idea, let me just go ahead and say – you’ll definitely love and enjoy this dish. I really wanted to highlight the flavours in this dish while keeping it all heart healthy. 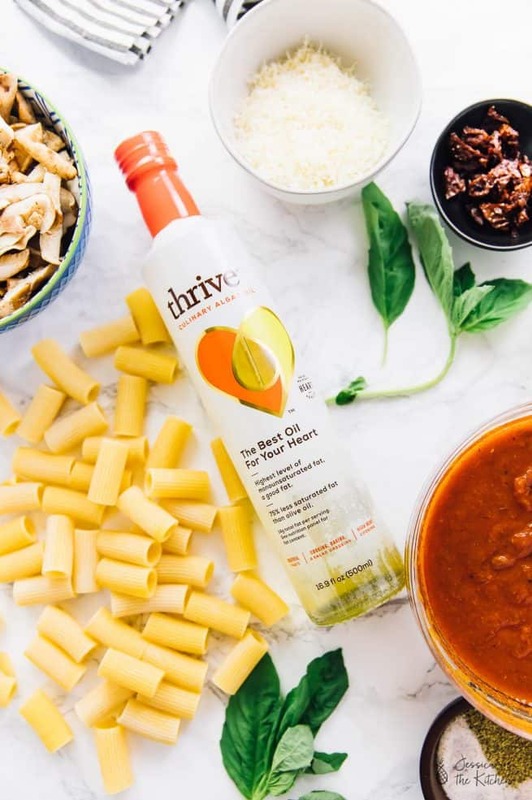 Naturally I immediately reached for my Thrive Algae Oil for this recipe. When I was approached to try this oil, I was definitely intrigued. Did you know that the algae was sourced from the sap of a Chestnut tree?! The makers of Thrive had studied hundreds of strains of algae to find the one with the best fat profile and taste. It’s fascinating to me all the ways that algae can be used to enhance our food. Plus, I’ve tried algal powder before and couldn’t wait to give this a try. First impressions: honestly, this is such a great oil! There isn’t any taste or smell at all. 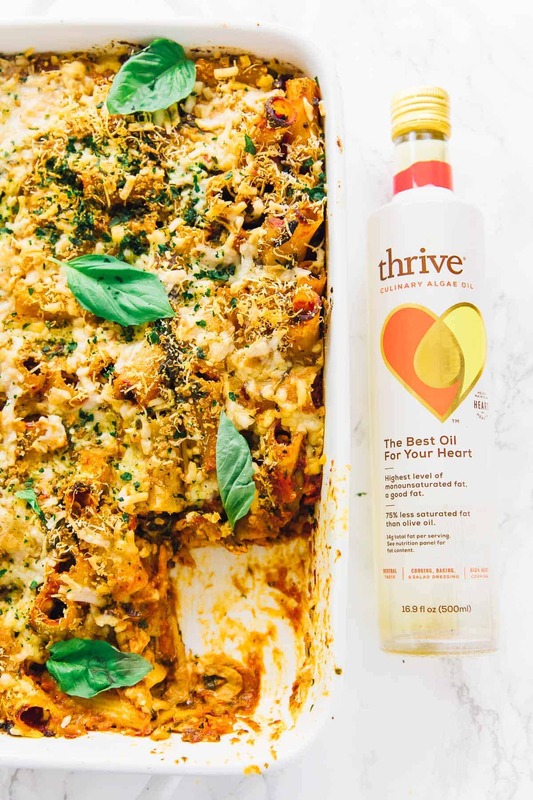 The Thrive Algae Oil acts as a beautiful enhancer to your dish instead of masking it, which I LOVE. It’s also known as the best oil for maintaining heart health. It contains a high percentage of monounsaturated fats (MUFAs) (AKA the good stuff like in avocado!). If you check the Amazon reviews on this, you’ll see so many people agreeing. Probably my favourite thing about the Thrive Algae Oil is that it has a really high smoke point. Gav loves to cook his food on high which always terrifies me a bit, so it’s good to know that he can safely use this oil. That also makes it amazing for stir-frying, or in my case, baking with it. 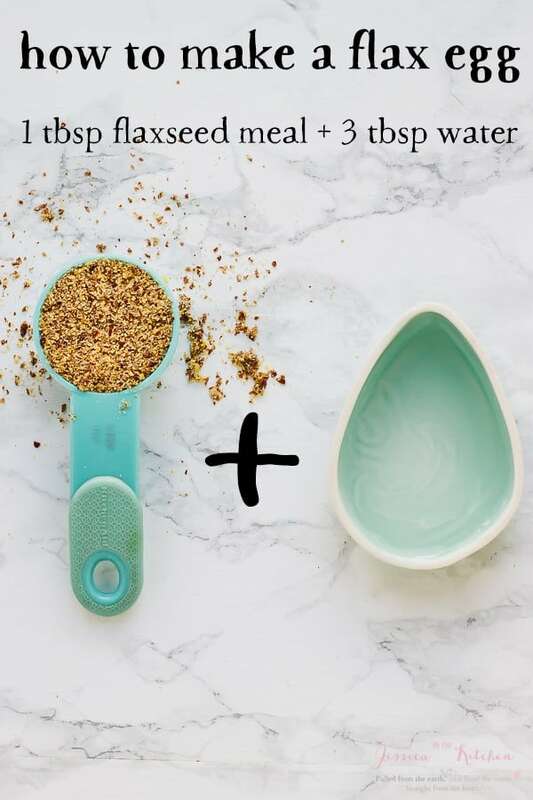 We’ve been using this for weeks now, so it really does last long and works in pretty much any dish! Like I said above, this Vegan Cheese pasta bake just tasted like that – an incredible and mouth watering pasta bake. Since then, we’ve used this oil in almost every dish and I’ve definitely fallen in love. Cook pasta according to package directions in a pot of salted water. Lightly grease a 13” x 9” pan with Thrive Algae Oil, and set aside. In a pan over medium high heat, add the Thrive Algae Oil. Add the mushrooms, sun-dried tomatoes and garlic and sauté down for about 5 minutes, until mushrooms are slightly shrived. Add in the spinach and season with sea salt and black pepper. Sauté down for about 3 minutes, until spinach is wilted. Stir in the tomato sauce, dried oregano and basil and stir to combine. Add the cooked rigatoni to your 13” x 9” pan, then add in the mix until top. Stir to combine. Add ½ cup of your vegan mozzarella throughout the dish and stir to combine again. Then top with remaining vegan mozzarella and vegan parmesan. Bake at 400 for 15-20 minutes so everything comes together beautiful and the cheese melts. Top with more basil and serve and enjoy! I don’t see any kale listed in your ingredients list. However in the instructions it calls for sauteing the spinach and kale. Please confirm which is right. Thanks. Sorry – no kale! I had originally planned to add it in that’s why. Thank you! I hope you enjoy!! Love this recipe. I really wowed my girlfriend with this. Thanks! I’m SO happy to hear that Anthony!! Me too! I’m so happy to hear that – and thanks for spreading the Thrive Algae Oil love!!! In the ingredients you mention 28-oz roasted tomatoes or marinara sauce, then 14-oz of the same. Was this just a typo ? Also, can “fire-roasted tomato sauce be used, like Rotel? Hi Denise. It isn’t a typo at all both cans are needed for the recipe, also yes you can use fire roasted tomato sauce. I hope this helps! What brand of vegan cheeses did you use? They melted nicely! Awesome! Thank you so much Mrs. Fawcett.